Home J. Barrett Hyman, M.D. v. The City of Louisville, et al. The City of Louisville and Jefferson County, Kentucky, enacted ordinances to prohibit discrimination based on “sexual orientation” and “gender identity.” J. Barrett Hyman, M.D. held Biblical and constitutional objections to complying with these ordinances in his practice of obstetrics and gynecology, and his suit to have them declared unlawful was dismissed by the trial court. Our firm was retained to file an amicus curiae brief in the U.S. Court of Appeals for the Sixth Circuit explaining the unconstitutional ambiguities inherent in these ordinances and why they should be declared void for vagueness. 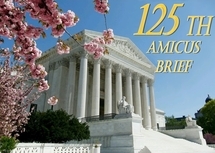 A Concerned Women for America article discusses this amicus brief.